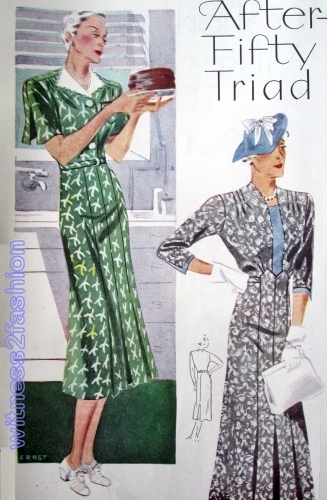 Vogue patterns featured in Ladies’ Home Journal, July 1936. 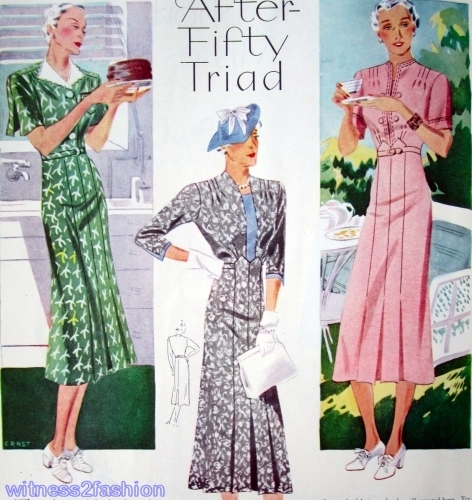 Announcing the first anniversary of Vogue-Journal “Easy-to-Make” patterns, Ladies’ Home Journal, August 1936. 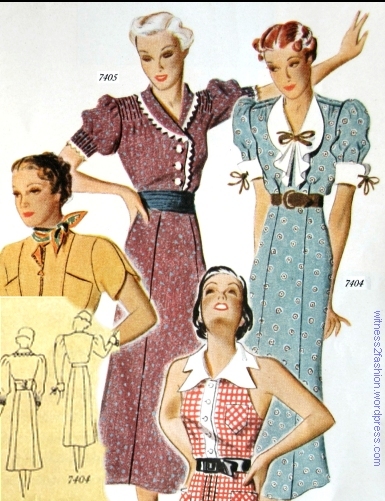 Most of the patterns illustrated above are “Easy-to-Make”, but none is the four-in-one pattern mentioned here. 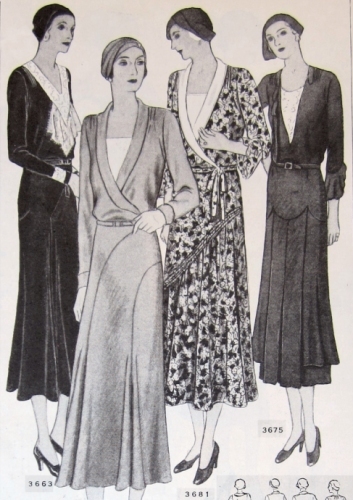 The Vogue-Journal patterns illustrated in July, 1936, are for “little summer daytime dresses.” One is a wrap dress, recommended for pregnancy; two are for “big ladies;” another has an optional zipper closing in front. 1936 is the year when couture collections began showing dresses — not necessarily sport dresses — with slide fasteners, although the zippered gold dress shown here is a sporty two-piece. 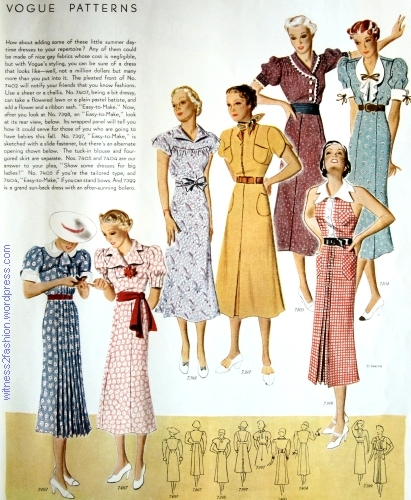 Summer dresses from Vogue patterns, Ladies’ Home Journal, July 1936. Nevertheless, there is a tempting variety of styles in these seven dresses. Vogue 7402 and 7407, July 1936. Ladies’ Home Journal. To my eyes, No. 7407 looks dressy, too. 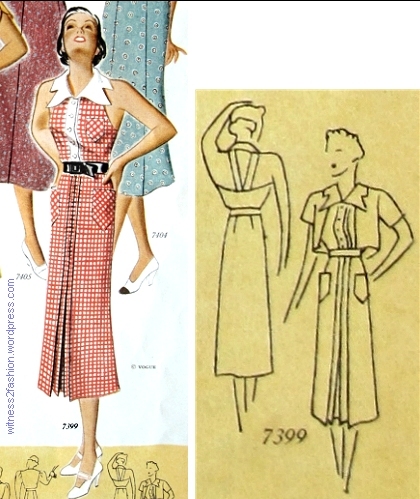 In fact, it reminds me of a yoked and pleated Albert Nipon dress I bought around 1980. 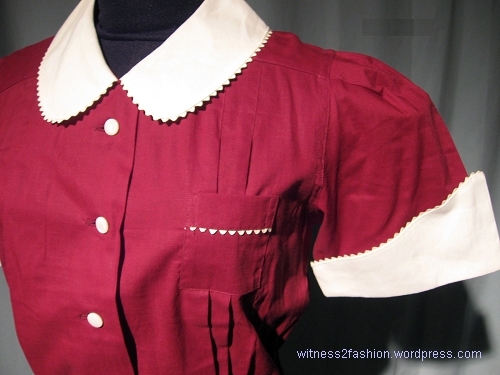 The shape of this yoke is unusual; the contrast collar and cuffs, puffed shoulders, little bow at the neck, and bodice-to-hem pleats all reappeared in 1980’s styles. 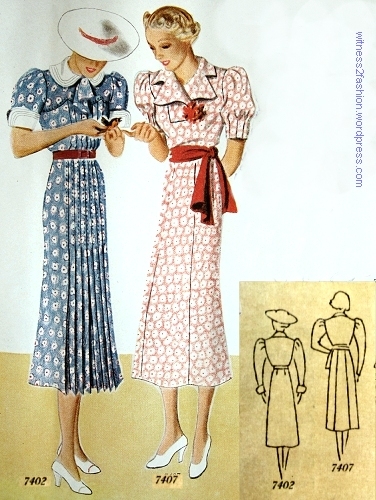 This dress, reserving its pleats for the center front, with a close, stitched-down fit over the hips, was probably more flattering than many 1980’s versions. 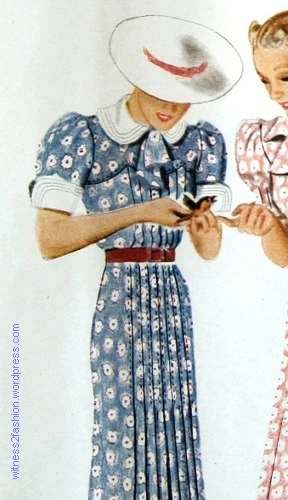 A 1936 dress that was echoed in the 1980s. Vogue pattern No. 7402. 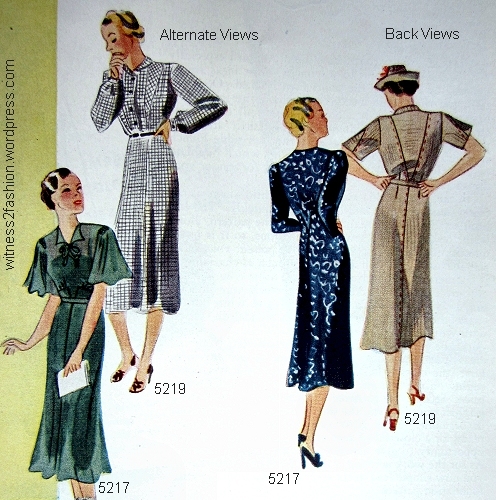 Vogue 7398 and 7397, July 1936. 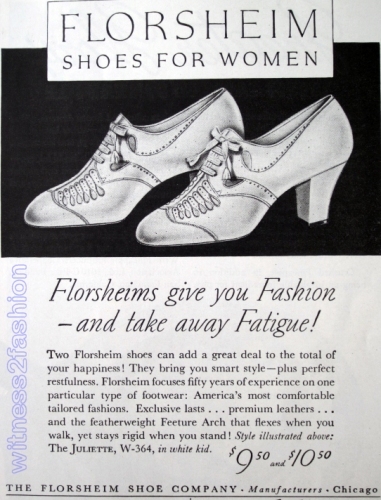 Ladies’ Home Journal. “No. 7397, ‘Easy-to-Make’ is sketched with a slide fastener, but there’s an alternate opening shown below. 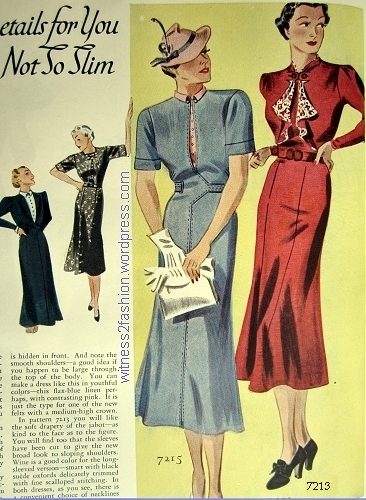 The tuck-in blouse and four-gored skirt are separate.” The novelty sleeve and partially in-seam bodice pockets are rather special. 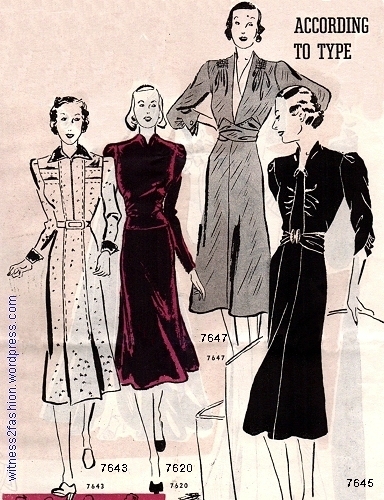 The bolero-shaped front bodice seams, sleeves and all pockets are top-stitched or prick-stitched. 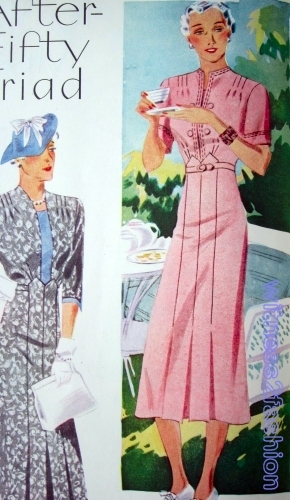 Vogue patterns 7405 and 7404 for “big ladies.” Ladies’ Home Journal, July 1936. 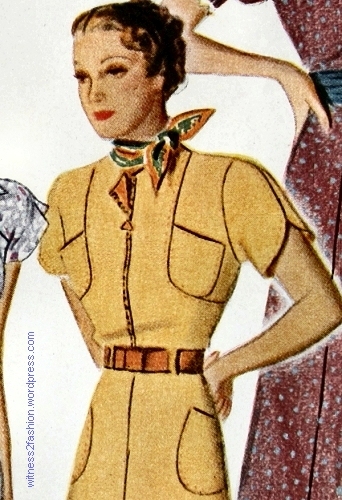 Small-scale rick-rack inserted in a 1930’s waitress uniform. 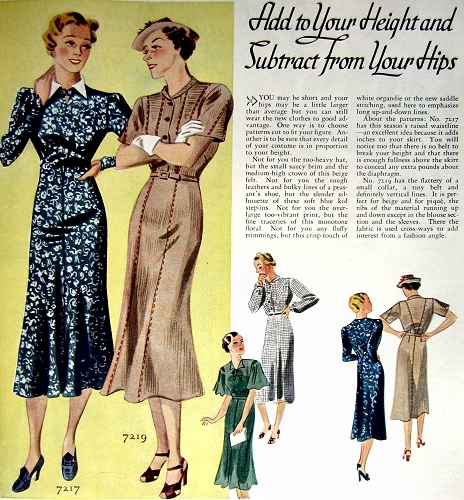 The range of available pattern sizes for “big ladies” were not mentioned in the LHJ article. As usual, they are illustrated on very thin ladies. 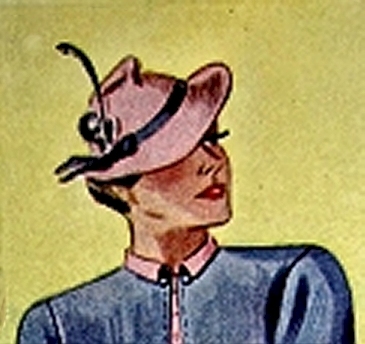 Vogue pattern 7399, Ladies’ Home Journal, July 1936. 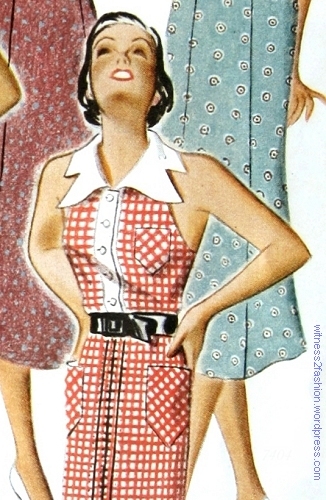 The bias pockets on this slim, red checked halter dress — plus the deeply notched white collar — give it that “Vogue” look. Stylish Details, Vogue No. 7399, July 1936. 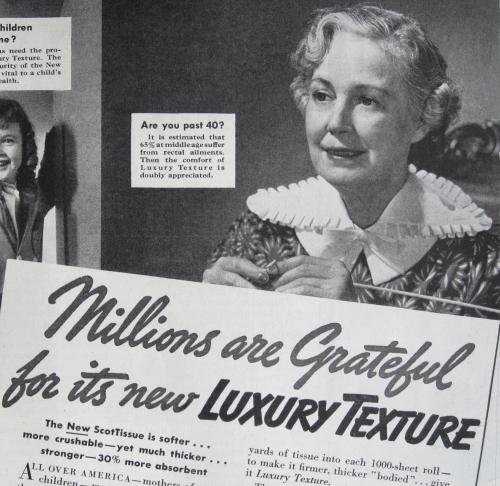 Ladies’ Home Journal. Just when you think you’re starting to understand the styles of a certain period, surprises come along. Dresses According to Type. 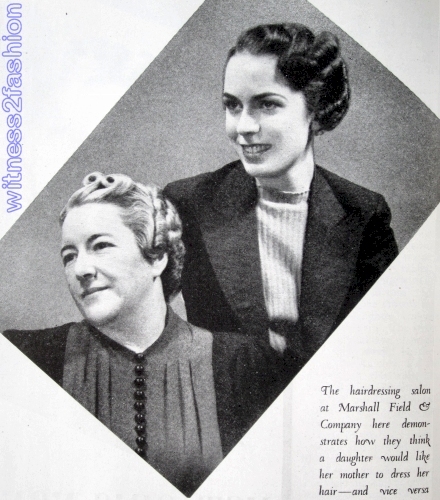 Butterick Fashion News, December 1937. 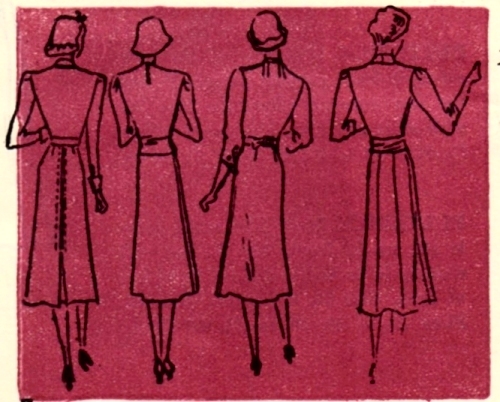 These four dress patterns were presented as appropriate for four different types of figure — and different ages. Can you tell which is which? The bodies illustrated don’t help much. 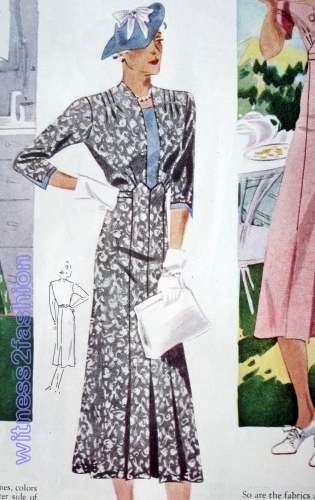 Companion-Butterick pattern 7633, for Junior Miss, sizes 12 -20 or bust measurements 30″ to 38″. 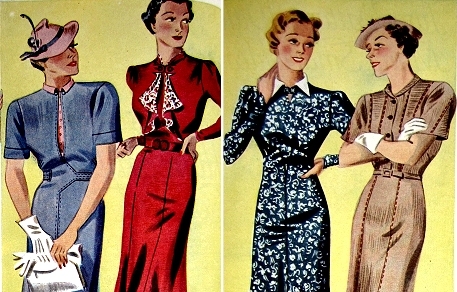 Butterick Fashion News, December 1937. Not very youthful, is it? The fact that the two figures on the left are in active poses while those on the right are standing still is a big hint. 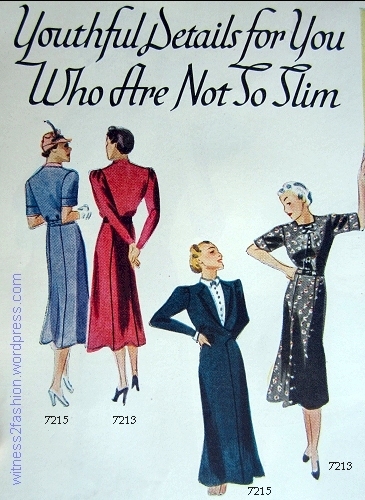 Those are styles for larger and older women. Here are the descriptions, from left to right in the main illustration. 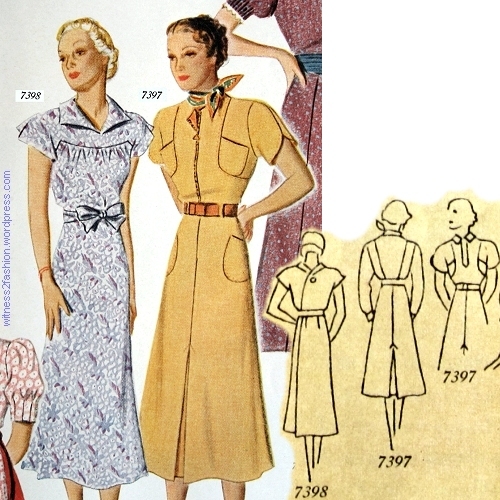 Butterick pattern 7643, for Misses 5’4″ and under, sizes 12 to 20, and bust 30 to 40″. Dec. 1937. I think the Smart Matron has the profile of Barbara Stanwyck. She certainly does not look like a woman with a 48″ bust, with waist and hips to match . . . . 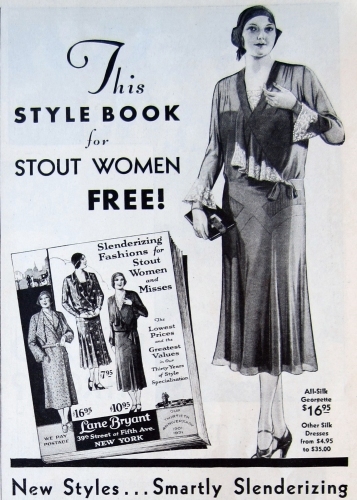 Readers of The Lost Art of Dress may recall that draped bodices and skirts were only considered appropriate for women in their 30s or older, women “of a certain age” and level of sophistication. Back views, 7643, 7620, 7647, 7645. 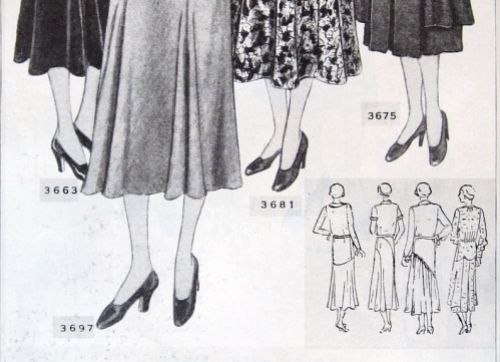 The woman of larger hip (7647) would probably benefit from a center back seam in her skirt to match the one in front. 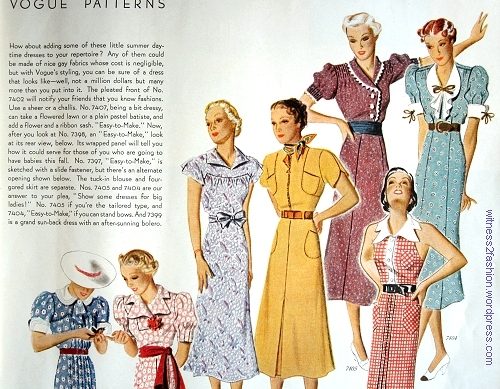 I had found a page of spring fashions for older women, so I was thinking about one of my favorite blogs, American Age Fashion: What American Women Wore, 1900 to Now. 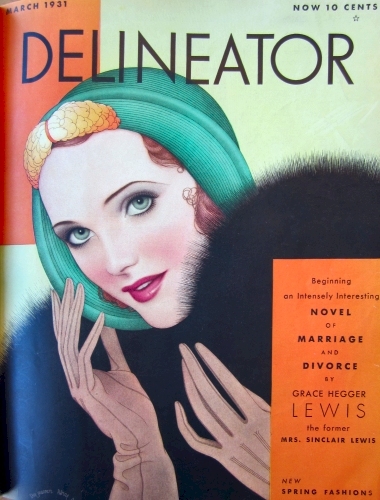 Serendipity: In the next day’s mail, I received a gift from Lynn at americanagefashion.com: a copy on fabric of the missing February 1931 cover of Delineator! (I haven’t photographed it yet.) In return, here are . . . This text is typed below — the print here is a bit small! 3675 ONE TYPE OF TUNIC The flared tunic is broken at the center front and back, so that it will not cut any length from the figure, and both skirt and tunic are joined to the long bodice in scalloped outline, Wear the belt where it suits you best. The flared three-quarter sleeves and lace vestee are flattering. 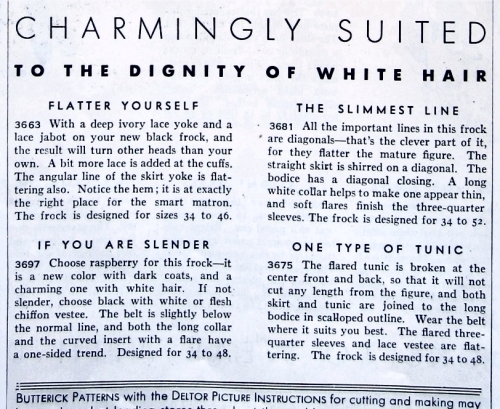 The frock is designed for 34 to 48 [inch bust measurement.] 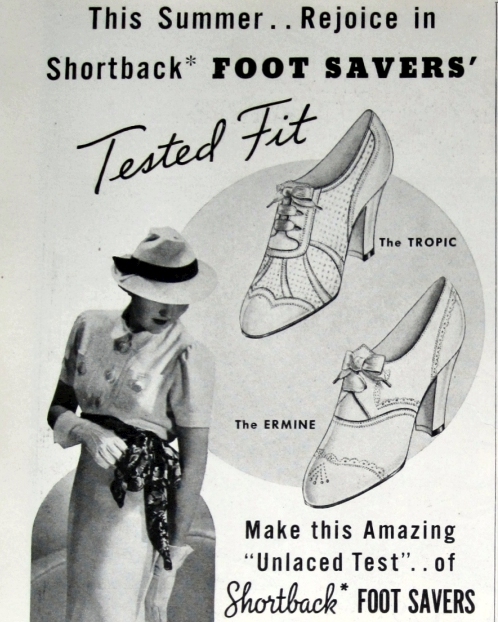 “Wear the belt where it suits you best” — in other words, if you are not ready to give up the low waistline of the 1920s.